Decorating the Church are many beautiful stained glass windows. Before memories of those to whom these windows were dedicated are lost, members of the History Committee, under the leadership of Margaret Kidwell, have researched the backgrounds of those memorialized. (The names of the researchers follow most of the accounts below.) 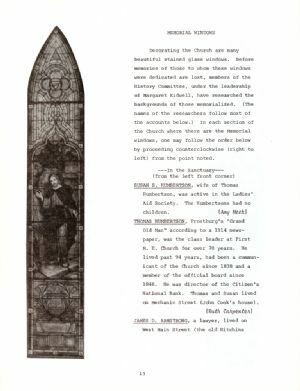 In each section of the Church where there are the Memorial windows, one may follow the order below by proceeding counterclockwise (right to left) from the point noted. THOMAS HUMBERTSON, Frostburg's "Grand Old Man" according to a 1914 newspaper, was the class leader at First M. E. Church for over 70 years. He lived past 94 years, had been a communicant of the Church since 1838 and a member of the official board since 1848. He was director of the Citizen's National Bank. Thomas and Susan lived on Mechanic Street (John Cook's house).